Need more information about booking Home 277469 ? 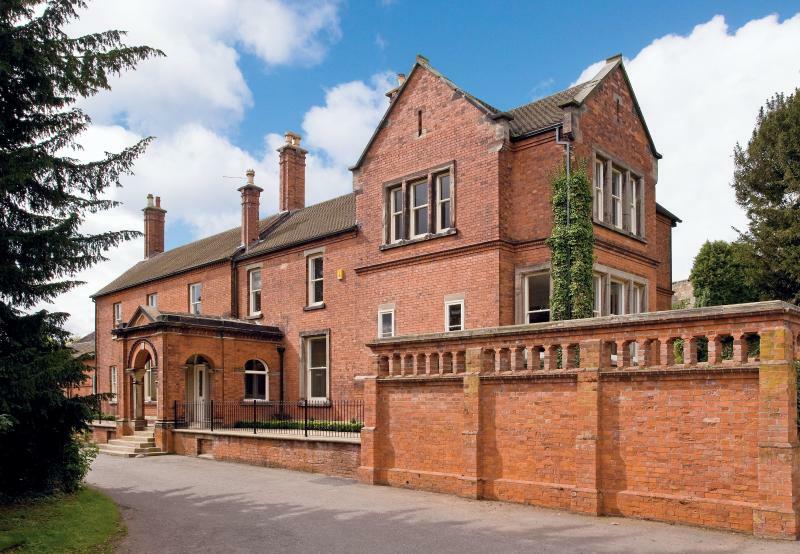 Castle Hill House stands in the historic grounds of Tutbury Castle in a fantastic elevated position above the village of Tutbury on the banks of the River Dove. The castle forms a dramatic backdrop to Castle Hill House, a perfect location for a tranquil getaway to the countryside, family celebration, golf holiday or simply for a beautiful base from which to explore with your family and friends. There are many fabulous spaces both in and outside Castle Hill House to relax and unwind during your stay. The beautiful high ceilings, deep windows and attractive archways let the light pour in and the grand staircase and large hallways give the feeling of grandeur. The house has both Georgian and Victorian sections giving it a wealth of character and is immaculately decorated throughout with luxurious deep pile carpets, chandeliers and beautiful decorative cornice work. Outside, the large garden has magnificent views of Tutbury Castle and the large brick built barbecue and patio area is great for socializing with family or friends. The children have plenty to keep them entertained with a play area with swing, slide and Monkey Bars! This House has 8 bedrooms, 6 bathrooms and sleeps 28. It’s been listed on Holiday Lettings since 02 Nov 2012. Located in Derbyshire, it has 42 reviews with an overall rating of 5. The average weekly rate varies from £3092 to £4466. I visited Castle Hill House along with a group of 17 ladies for a 'sophisticated' hen weekend. It was fabulous. The location was perfect and the accommodation was impressive, comfortable and ideal for our group. It was clean and well equipped and it had everything we needed. Nothing was too much trouble either. We asked if the Xmas decs could be put up at the request of one of our brides to be and it looked really special. I would absolutely recommend Castle Hill House. It is perfect for large groups, family get togethers, etc. I am already thinking of an excuse to go back. Owner's reply: Thank you for your kind review. We are so pleased you had a fantastic weekend and glad the Christmas decorations helped you get into the festive spirit! When looking for a property to take 22 hens to for the weekend, i knew id hit gold when i found Castle Hill House. Lisa & Andrew made the booking process so easy, and answered any questions prior to our stay very promptly. The house itself is spectacular, and everyone was in awe as they arrived. Everything we could possibly have needed was provided including crockery, towels, bedding, music system, wifi, everything! It was obvious a lot of thought had gone in to what would be needed.... The whole house is decorated, cleaned and furnished to a high standard and it seemed no corners had been cut, very impressed... Ian met us at the house on Friday afternoon and gave us the tour, telling us everything we needed to know about getting in and out, where everything was, and was always available to text/ring if we needed to know anything else or had any problems. The mix of bedroom sizes in the house made it so easy to decide on sleeping arrangements and everyone commented how comfortable the beds were. Most of the bedrooms were ensuite which defo helped when everyone was trying to get ready. We decided to stay in on Saturday night rather than venture in to the village (Even though Ian had told us that every pub was worth a visit) the dining room was perfect for us all to eat together and play some games, and the staircase from the living room to the hall provided an great dance off arena. There are loads of seating areas in the house, meaning there can be quiet civilised convos going on in one room, and more raucous games going on in another, somewhere for everyone! Tutbury itself is a nice town, and a few of the hens went for a wander on Sunday afternoon in search of a roast dinner. Getting to the house was easy for everyone involved, with people travelling from Shropshire, Hull, Leeds & London, and having the train station in the village was a bonus for those travelling from further afield. All in all, we all had a great weekend, and i wouldn't think twice about booking to stay there again, its not everyday you get to wake up with a view of a castle in your garden and peacocks roaming about! We came to Castle Hill House for a family holiday, there were 25 of us altogether and the house was big enough to accommodate us all, but plenty of room if we wanted our own space too. The lounge and dining room fit us all in comfortably so we could all be together. The bedrooms were beautiful. When we arrived at the house it felt like we were the first to ever stay there, and all the rooms smelt gorgeous which was a nice bonus! The garden was big enough for the kids to play in and the swings and slide kept them busy all week, and it was nice to know they were quite safe as the garden is walled with a secure gate. The only small downside is the house is right next to a grave yard and there was sadly a funeral the week we were there. It wouldn't put me off going again but obviously you have to be mindful of noise levels outside so not to be disrespectful, (we brought the kids in so we didn't disrupt the service). Other than that, lovely surroundings, it was nice waking up hearing the birds (and the peacock!!). We sadly didn't get to go into the actual castle as it was closed due the time of year, but if you can go in summer the castle looks worth a visit. Tutbury itself is a really sweet little village and we found the people to be very very friendly. A few nice gift shops and some great pubs. A bit of a walk to the village and then a hike back up the hill to the house, but worth it. We really enjoyed our stay and were sad to leave. Thanks for everything Castle Hill House! We were five families including adults, teenagers, kids and babies who stayed over New Year at Castle Hill House. We all had a great time. Within the house, and on its grounds, we were all catered for. Coming and going is easy from a very accessible and secure 'on-grounds' car park. The specification is high and Andrew & Lisa have worked very hard to keep or renew period features. Every room has a luxurious feeling and yet practical enough to withstand exuberant kids! The layout is perfect for group activities with enough comfy nooks in which just a few people, or Dad with the newspaper, could relax. All of the bathrooms and bedrooms are clean and bright too. Some of the views are really cool overlooking the Castle to the rear and a green to the front. The kitchen was a constant focal point for all and well equipped to keep everyone happy. Loads of good pubs with good food within a few minutes walk. Andrew & Lisa made the booking arrangements and communication very easy and this put us at ease right from booking, introduction around the house and leaving. We would definitely recommend this venue to groups of Friends or family. You can get in touch with Lisa (the owner) through the contact form on this page. Send Lisa (the owner) an email through the contact form on this page. Alternatively, if there’s a phone number on this page, you can call them. How do I contact Lisa (the owner)? If you’ve already booked, go to Manage your holiday booking to view Lisa the owner's contact details or send them a message. Or send Lisa (the owner) an enquiry through the Contact the owner/manager form if you’d like a quote or more info first. When you pay online through the Book your stay form, a booking request is sent to Lisa (the owner). You’ll find out within 24 hours whether they’ve accepted - no money will leave your account before then. You can also request a quote from Lisa (the owner) through the contact form. The owner will email you the total cost for your dates and a link to book and pay online. Use the Book your stay form to pay provisionally online. You can pay by credit/debit card or PayPal. Lisa (the owner) will have 24 hours to accept the booking and no money will leave your account before then. Why can't I call Lisa (the owner) before booking? You’ll need to contact Lisa (the owner) to do this. Send them a message in Manage your holiday booking or through the contact form on this page. You can request to change the dates or number of people on your booking via the Manage your holiday booking page. To change your holiday dates use the Edit booking button. If you need to change the number of guests staying then send Lisa (the owner) a message. If Lisa (the owner) agrees, they’ll send you a revised quote outlining the changes. You can review and accept/decline this from the Manage your holiday booking page. You’ll have 48 hours to take action before the revised quote expires.